Gold Peg makes industrial food processing equipment, specialising in direct steam injection continuous cooking technology. Gold Peg designs, manufactures, installs, and supports high performance food processing equipment, with the goal of improving the productivity of food manufacturing companies around the world. Precise, controlled, flexible Direct Steam Injection technology makes the RotaTherm® a most coveted continuous cooking system. The RotaTherm® is used for processed cheese, sauces, taco meat and wide range of food applications. The GPiCS Mozzarella Cooker Stretcher uses no bath cook water; rather, controlled direct steam injection technology is used for the continuous production of Natural Mozzarella and Pasta Filata varieties. The following equipment can be either supplied as modules or as part of a complete turnkey food processing line. Our robust grinders have a high rate and particle size of 2.8mm and the ability to grind natural cheeses, and frozen cheese and butter in preparation for blending. 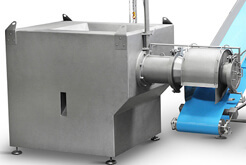 The hygienic conveyor moves ingredients between two points. It is an easy clean design specifically for the food manufacturing industry. 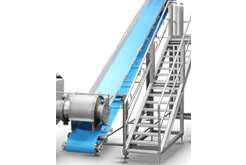 The conveyer can swivel or be fixed to deliver ingredients. 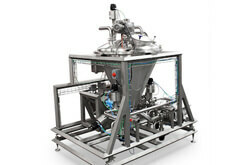 The twin ribbon blender mixes ingredients and is designed for medium to high viscous products. Capacities up to 5000kg available with full CIP system. 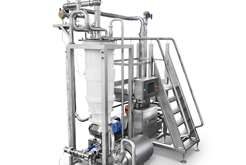 A robust Auger Feed Hopper (AFH) provides a constant feed of your blended food product into the RotaTherm® and is supplied as part of a complete food processing line. This self-cleaning probe, designed uniquely by Gold Peg, ensures accurate temperature monitoring over long runs. Specifically designed for industrial food equipment, the vacuum flash vessel offers direct set point cooling, deaeration and density control of your food product. The surge vessel is interface with the downstream filling equipment (a 'buffer tank'). It provides the automatic speed control of the system. 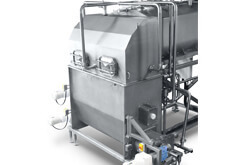 The creaming tank option builds product viscosity. Gold Peg's advanced control systems ensure the optimal performance and operation of their continuous cooking and processing systems. Is Gold Peg's continuous cooking system right for you?